ST. PETERSBURG, November 13. /TASS/. 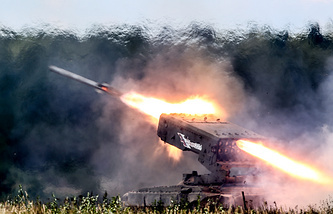 A company armed with TOS-1A Solntsepyok (Scorching Sun) heavy flamethrower systems has been set up within the radiation, chemical and biological defense regiment of the combined arms army in the Western Military District, the District’s press office reported on Tuesday. The heavy flamethrowers company is based in the Leningrad Region in northwest Russia, the press office said. Before the company was set up, drills were held at a proving range in the Leningrad Region, using Solntsepyok heavy flamethrowers and RPO-A rocket-propelled infantry flamethrowers to practice strikes against enemy engineering fortifications. Now it has been officially announced that a new unit armed with TOS-1A heavy flamethrowers has been set up. "A unit of heavy flamethrower systems of the Western Military District has been formed in the Leningrad Region. The regiment has completed establishing the unit of heavy flamethrower systems, which has received TOS-1A Solntsepyok weapons as its armament. Also, reconnaissance units have received the most advanced RKhM-6 chemical reconnaissance vehicles under the defense procurement program this year," Commander of the Radiation, Chemical and Biological Defense Regiment Colonel Alexei Suslov was quoted by the District’s press office as saying. The TOS-1A Solntsepyok heavy flamethrower is a multiple launch rocket system, which comprises a BM-1 combat vehicle, a TZM-T transporter-loader and an ammunition load of rockets. The TOS-1A heavy flamethrower system is a unique weapon by its incorporated technical solutions, assigned combat missions and combat efficiency and is unrivaled in the world. The TOS-1A is capable of firing both thermobaric rockets and smoke-incendiary munitions. The flamethrower is designed to set ablaze and destroy buildings and structures and damage an enemy’s lightly armored vehicles.